The Medallion picture is a Veterans' Day themed worksheet which reinforces graphing ordered pairs on a coordinate plane. Students plot the ordered pairs and connect them in order to reveal the picture. Make sure you visit my store for more ordered pair pictures. The Presidents' Day themed worksheet uses a picture of Abraham Lincoln to reinforce graphing ordered pairs on a coordinate plane. Students plot the ordered pairs and connect them in order to reveal the picture. Make sure you visit my store for more ordered pair pictures. The Valentines themed worksheet reinforces graphing ordered pairs on a coordinate plane. Students plot the ordered pairs and connect them in order to reveal the picture. Make sure you visit my store for more ordered pair pictures. The St. Patrick's Day themed worksheet reinforces graphing ordered pairs on a coordinate plane. Students plot the ordered pairs and connect them in order to reveal the picture. Make sure you visit my store for more ordered pair pictures. The Pilgrim Hat picture is a Thanksgiving themed worksheet which reinforces graphing ordered pairs on a coordinate plane. Students plot the ordered pairs and connect them in order to reveal the picture. Make sure you visit my store for more ordered pair pictures. The Jack o'Lantern picture is a Halloween themed worksheet which reinforces graphing ordered pairs on a coordinate plane. Students plot the ordered pairs and connect them in order to reveal the picture. Make sure you visit my store for more ordered pair pictures. The Groundhog Day themed worksheet reinforces graphing ordered pairs on a coordinate plane. Students plot the ordered pairs and connect them in order to reveal the picture. Make sure you visit my store for more ordered pair pictures. 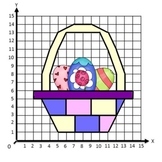 This Mother's Day themed worksheet can be used to reinforce graphing ordered pairs on a coordinate plane. Students plot the ordered pairs and connect them in order to reveal the picture. Make sure you visit my store for more ordered pair pictures. This jokers hat ordered pair picture can be used as an April Fools themed worksheet which reinforces graphing ordered pairs on a coordinate plane. Students plot the ordered pairs and connect them in order to reveal the picture. Make sure you visit my store for more ordered pair pictures. This tree ordered pair picture can be used as an Arbor Day themed worksheet which reinforces graphing ordered pairs on a coordinate plane. Students plot the ordered pairs and connect them in order to reveal the picture. Make sure you visit my store for more ordered pair pictures. The Santa hat picture is a simple Christmas themed worksheet which reinforces graphing ordered pairs on a coordinate plane. Students plot the ordered pairs and connect them in order to reveal the picture. Make sure you visit my store for more ordered pair pictures. The simple Pi Day themed worksheet reinforces graphing ordered pairs on a coordinate plane. Students plot the ordered pairs and connect them in order to reveal the picture. Make sure you visit my store for more ordered pair pictures. This Super Bowl and football themed worksheet can be used to reinforce graphing ordered pairs on a coordinate plane. Students plot the ordered pairs and connect them in order to reveal the picture of the NFL Lombardi Trophy. Make sure you visit my store for more ordered pair pictures. This lion themed worksheet can be used to reinforce graphing ordered pairs on a coordinate plane. Students plot the ordered pairs and connect them in order to reveal the picture of a lion.Make sure you visit my store for more ordered pair pictures. This world globe ordered pair picture can be used as an Earth Day themed worksheet which reinforces graphing ordered pairs on a coordinate plane. Students plot the ordered pairs and connect them in order to reveal the picture. Make sure you visit my store for more ordered pair pictures.